Would you like to be the real warrior and kill all these foes?! Then this is your chance. Here you must kill all the enemies and just set the best record. Watch out! They are coming! Be sure that you can cope with it. Vanquish the game. 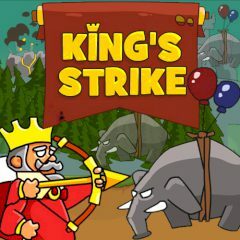 So, in the game King's Strike will be your task to build walls and towers so offensive to protect the king. Just imagine that enemies will come in waves, between which you can purchase additional items for defense. But for that you need the money they get for killing enemies, by the way, in addition to the defensive towers you can attack the enemy and yourself, as the king has in his hands a bow and arrows. Is everything clear? Then just go ahead and play the game. So try good measure. You can be sure that everything depends on you. Have much fun here.